There have been more than 400 cases of measles already in 2018 – making this officially an outbreak. 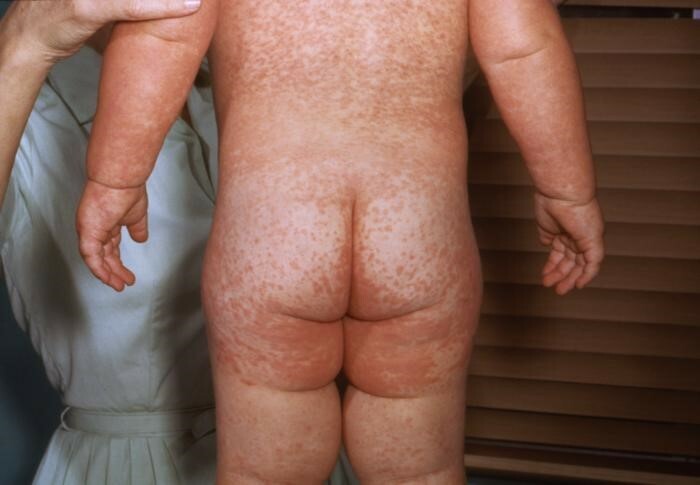 Young children and babies are at risk from measles because it is highly infectious. Although it can be a minor (if deeply unpleasant) experience. It can also, in very rare cases, lead to serous complications. Before the MMR vaccination programme began, measles caused around 2.6 million deaths worldwide every year. Children under one will not have been vaccinated for measles, mumps and rubella. But don’t let this frighten you. The biggest risk group for this infectious disease is teenagers who didn’t get their MMR. Especially when they attend festivals and events where they are in close proximity. Babies are not often exposed to measles unless you live in a community that has avoided the vaccination programme. First make sure that you and everybody who comes into contact with your baby has had both parts of the MMR vaccine. That reduces risk massively. It’s incredibly rare for a baby to catch measles when their community has been vaccinated. Second, take up the offer to have MMR when your newborn is one. Make sure they get the pre-school booster too. The scary truth is that 9 out of 10 unvaccinated children who are exposed to measles will develop the symptoms. Between newborn and six months a baby with measles may be offered HNIG. Human Normal Immunoglobulin. Which will boost their measles antibodies and reduce symptoms. HNIG works best in the first three days of the ten day incubation period. So it’s really important to react early. Between six and 12 months your baby may be offered the MMR if there is measles in your area but she hasn’t come into direct contact with the disease. Remember that because this is a communicable disease your GP may visit you at home. Ask you to be seen in a side room so you don’t come into contact with other people and/or ask you to accept the last appointment of the day. relieving symptoms by using appropriate pain relief under medical guidance. ensuring baby remains hydrated if they have a high temperature. bathing sore eyes with lukewarm salt water. lowering light levels to relax tired eyes. using a vaporiser or a hot wet towel on a radiator to add moisture to the air to ease a cough. Drowsiness that doesn’t pass, accompanied by floppiness of the neck and limbs. These are very rare developments but should be immediately addressed by calling an ambulance (and explaining your baby has measles to protect other hospital patients) and informing your GP. There are major measles epidemics in Romania and Italy and a lot of the cases being seen are people who have travelled to Europe or spent time with those who’ve been in Europe recently. Outbreaks are localised – around 150 in London, 80 in the South East and a similar number in the West Midlands with around 40 in both the South-West and West Yorkshire. In conclusion – measles isn’t an inevitability and nor is it something to be taken lightly. Trusting your judgement and ensuring your and your family are up to date in vaccinations will keep your baby safe.